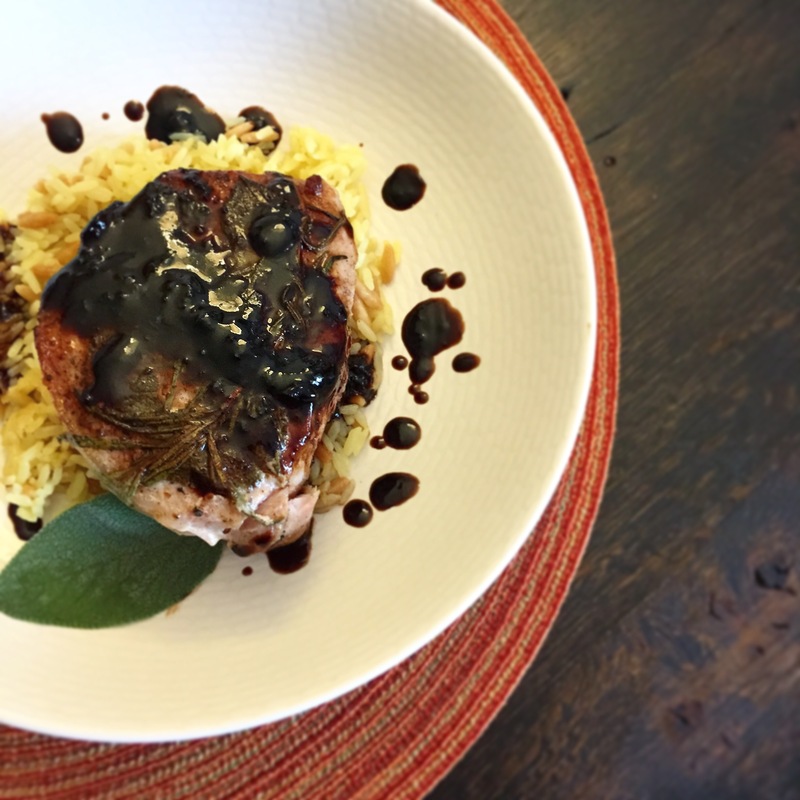 Oink Oink: Sous Vide Pork Chops with Balsamic Apricot Glaze – Pao Says, "Open Wide!" What a busy past couple of weeks! Now that we are settled into our new place in DC, we have had friends and family visiting us non-stop. Its been a bit hectic for us, but so, so great to have people we love come and spend time with us to check out our new home and new city. One of the cool things about having all of these visitors is that I’ve been getting to cook for a crowd; something I grew up doing with my mom and love doing to this day. My family was in town this past week, and one of my dad’s favorite meals is pork chops. Unfortunately, when it comes to getting a thick cut of pork, it can be difficult to get the piece of meat to the right temperature, and, often, what happens is that you end up with a dry chop. NO MORE!! My husband, Ryan, got me an Anova Sous Vide for our anniversary, and I have come to discover that THIS is the trick to cooking a perfect pork chop! Sous Vide, French for “under vacuum”, is a method of cooking in which food is sealed in airtight plastic bags (I have been using the Food Saver vacuum seal system), then placed in a water bath at a specific, controlled temperature ensure that the item is cooked evenly and retains moisture. The Anova Precision Cooker is about the size of a wine bottle, and you just hook it up inside a pot or large container filled with water. You can control the precise temperature on the cooker, itself, or via bluetooth on your phone. I cooked my chops to an exact 135 degrees F for about 90 minutes, and then seared them in a screaming hot cast iron skillet with some butter to give them some color and texture. The resulting dish was truly a crowd-pleaser… my dad already wants mom to make him a second round! If you don’t have one of these kitchen gadgets, I highly, highly recommend it. In my opinion, the sous vide method is the easiest, most fool-proof way to get your meats (or veggies, you can almost cook anything via this method), to the perfect temperature and texture. I’m telling you, you will be the most impressive home cook on the block with this method up your sleeve! Set up your Precision Cooker to 135 degrees F. Season the pork chops on all sides with salt and pepper. Place a sprig of rosemary, sprig of thyme, and 1-2 sage leafs on top of each chop. Place the seasoned chops in the vacuum-seal bag (or in a ziplock bag, if you don’t have a vacuum seal system), and seal the bag. *If you don’t have a vacuum-seal system, just squeeze all of the air out of the ziploc bag before you cook your meat. Once the temperature is reached, place the sealed bags of meat in the water bath and set timer for 90 minutes. This doesn’t have to be precise. You can leave them in there anywhere between 1 hr and 20 minutes and 2 hours and get the same result. With about 5-8 min left on your timer, place a cast iron skillet over high heat. You want this skillet to be smoking hot by he time you put the pork chops on it. Remove the chops from the water bath, take them out of the bag, and place them in the hot cast iron skillet with a tbsp of butter. You want to give these some nice color, so, if the pan is very hot, this should take about a minute or so to a side. Once you get some nice caramelization, your pork chops are ready for your super fancy glaze! Combine and whisk together the balsamic vinegar and the apricot preserves in a small pot. Bring to a boil, and then reduce to a simmer. Cook until the sauce becomes thick and syrupy, and has reduced to about 1/2 of its original volume- about 15-20 minutes. You’ll know it’s ready when you dip a spoon in and the glaze sticks to the back of it. Thats it! Now just drizzle it over your pork chops and get ready to wow everyone… Yay Master Chef! !